Today we honour the million babies worldwide who died this year because they were born too soon, and the 12 million more who struggle to survive. November 17 is World Prematurity Day, raising awareness of the serious problem of premature birth and helping to give our smallest world citizens the healthy start they deserve. A global alliance of organisations and their members launched World Prematurity Day to focus everyone’s attention on this serious problem and to fight, because babies shouldn’t have to. A bittersweet day then to find out that my story of Elsie’s premature arrival (Flame of hope) ‘has won a very prestigious writing award’. That was Anthony’s description of the 2011 Wimmera Regional Library Corporation writing competition! There were two sections. I entered the story in the adult open section for a couple of reasons; firstly, I’m an adult. Secondly, the other section asked for stories about why you live where you live. And strangely I didn’t know what 2000 words I might write on that subject. Why do I live in Australia? Why in the Wimmera? Why this farm or why this house? I’d have had to think long and hard and there wasn’t the time before the competition closed, so I flung my only short story their way. Anthony suggested I’m a bit like a one-hit-wonder (we both thought that was incredibly funny. And true…); I’ve entered Flame of hope in four competitions now. It was short-listed in one, long-listed in another, and now, (yay for me, insert happy chest-puffed-out-I’m-an-award-winning-writer dance) has been announced the winner of this one. An abbreviated version of it also appeared in the LittleONE baby magazine (Issue 2 2009) after they asked for submissions on premature babies. Weren’t we lucky to be able to conclude our story on a positive note? 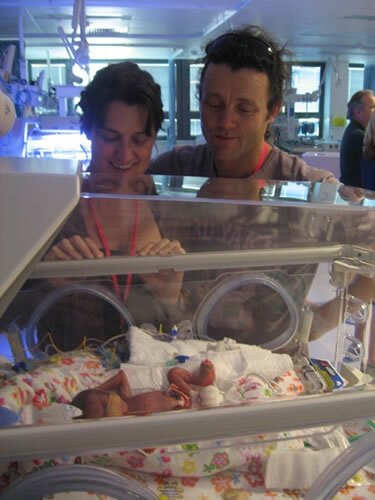 That of the 45,000 babies in Australia admitted to neonatal intensive care and special care units each year, we got to bring ours home. Today we honour all of our amazing children. Thanks to our dear friends, Christine and Casey. That’s why I live where I live. That is amazing Larissa…this is a bit late love, but congratulations. I love your writing. Hi I’m Cindy’s mum. She gave me your web address to look at your beautiful handmade clothes and gifts. I am very impressed. I must say your stories touched me even more. 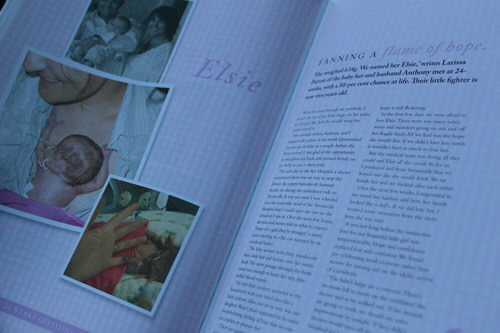 The story of the birth of Elsie bought tears to my eyes. The happy ending and home coming was a delight. Your short stories and photographs are so natural, and highlight the pleasure family life can bring. Happy memories of my own life, with four young kids on the family farm, come rushing back. I too, feel very blessed. Hi Robyn, thanks so much for taking the time to comment with those kind words and memories of your own. I guess you’d have had added pressure of limited trips to town, not like now when we nick in if we’re out of baby wipes! I hope you’re getting to spend lots of time with Cindy and those gorgeous twins. Thank you once again, Larissa. St Arnaud is such a lovely community, I once got lost there on my way to Charlton (I know, how did I get lost?!) and the locals were so helpful in providing me with a mud map on how to get to my Nannas house in Charlton. My nephew was born 4 weeks ago at 25 weeks gestation, I can’t wait to share your blog with my sister. Hi Maryanne, I wish your sister all the best with the roller coaster journey she’s on (in fact, you’re all aboard) with her baby boy. I’m sure there will be many ups and downs and staying positive is easier if they can view every day and every little event as a milestone. My fingers are crossed for them to experience more highs than lows and a miraculous outcome. Small town communities are like that – I’m sure your Nanna will vouch for that too!